Kapulanikai Vacation Suites in Kihei, Hawaii offers a tranquil respite surrounded by some of the most beautiful scenery Hawaii has to offer. Just minutes away from pristine beaches, championship golf courses, tennis courts, deep-sea fishing and scuba diving, you can have the vacation of a lifetime every year when you find these Maui timeshare resales. 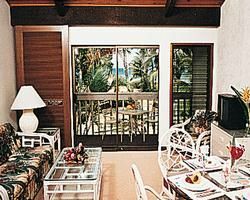 Owning a timeshare in Kapulanikai Vacation Suites means you have a vacation condo that is a beautifully decorated, beachfront one-bedroom suite with a private lanai or balcony and a magnificent view. You will have private front and rear entrances, living and dining area, cable TV, a fully equipped kitchen and laundry facilities,. You no longer need to haul your kitchen utensils and bed linens on your vacation or worry about upkeep. Your beautiful home will be clean and ready when you arrive. You can just show up and head for the beach. 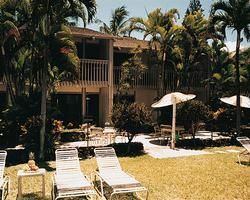 Kapulanikai Vacation Suites has beautiful landscaping with manicured lawns where you can watch the famous western Hawaii sunsets. The locality offers surfing, snorkeling, sailing, kayaking, whale-watching and beautiful walks along the beach. Kihei is located on the western shores of Maui and is the home of the Humpback Whale National Marine Sanctuary. It has sunny, warm weather year-round and is one of the best places in Hawaii for a winter getaway. The Kealia Pond National Wildlife Refuge is a popular place for locals and visitors to see protected wetlands that attract migrating birds, especially during the winter. The town also has several excellent restaurants for the days you want a break from cooking. Maui timeshare resales provide you the opportunity to become part of this famous and popular vacation destination. You will be able to enjoy a first-class vacation for a fraction of the price you would ordinarily pay on Maui. If you want to spend your winter on the slopes, it is no problem. Just exchange your timeshare for a comparable one at one of many available mountain resorts through an exchange service. Kapulanikai Vacation Suites provide a cozy, private vacation condo right on the beach with all of the amenities you would expect at a top Hawaiian resort. Contact Kapulanikai Vacation Suites Specialist Today!